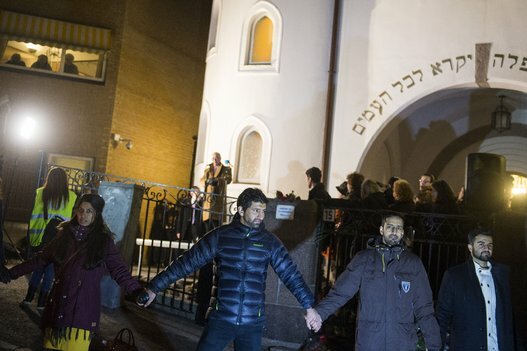 OSLO, Feb 21 (Reuters) – More than 1000 Muslims formed a human shield around Oslo’s synagogue on Saturday, offering symbolic protection for the city’s Jewish community and condemning an attack on a synagogue in neighboring Denmark last weekend. Chanting “No to anti-Semitism, no to Islamophobia,” Norway’s Muslims formed what they called a ring of peace a week after Omar Abdel Hamid El-Hussein, a Danish-born son of Palestinian immigrants, killed two people at a synagogue and an event promoting free speech in Copenhagen last weekend. “Humanity is one and we are here to demonstrate that,” Zeeshan Abdullah, one of the protest’s organizers told a crowd of Muslim immigrants and ethnic Norwegians who filled the small street around Oslo’s only functioning synagogue. Norway’s Jewish community is one of Europe’s smallest, numbering around 1000, and the Muslim population, which has been growing steadily through immigration, is 150,000 to 200,000. Norway has a population of about 5.2 million. The debate over immigration in the country came to the forefront in 2011 when Anders Behring Breivik killed 77 people and accused the government and the then-ruling Labor party of facilitating Muslim immigration and adulterating pure Norwegian blood.